TEPCO, the Japanese power company who own the Fukushima nuclear power plant, are in an unenviable position. Their Fukushima nuclear power plant is the site of one of the world’s worst industrial accidents, they have been accused of not just incompetence but of falsifying safety records and yet they have to continue to supply power to Japan. Japan itself is facing some significant challenges – only 17 of its 54 nuclear power reactors are operational heading into August, traditionally its month of peak demand. Japan needs to try to avoid rolling blackouts, and TEPCO has stepped up to helping out. On TEPCO’s home page they give top line data for the maximum demand for the day, as well as the maximum amount that will be able to be supplied. As long as the demand doesn’t exceed the supply, no blackouts. 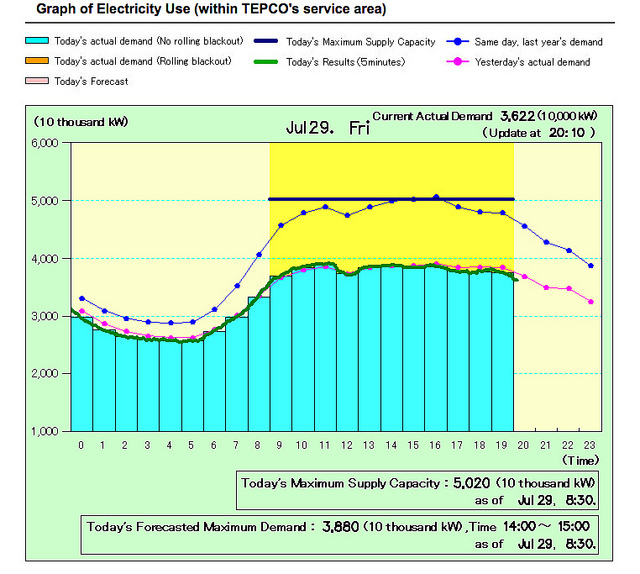 TEPCO have gone further though with a realtime chart of energy demand (updated every five minutes) versus maximum supply and also graphed against the demand on the same day in 2010 (see the chart at the top of this post). We have long argued here on GreenMonk that giving people access to information will help change behaviour. This campaign is a great example of realtime energy information in action and it appears to be helping because electricity consumption is down around 15% on last year.